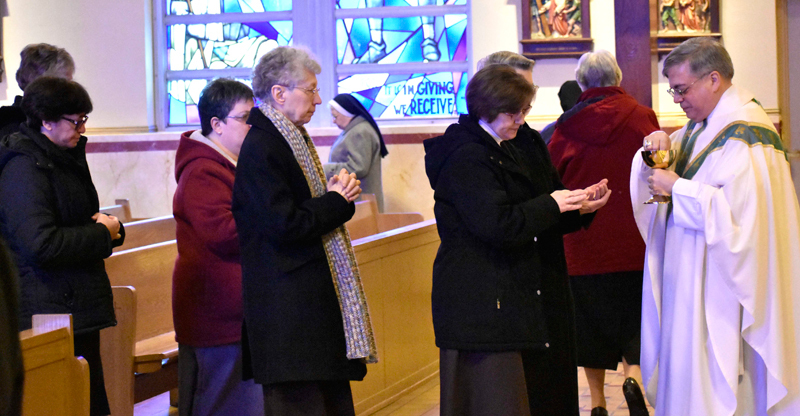 “What a privilege it is for me to celebrate the World Day of Consecrated Life together with you who are my collaborators in the Diocese of Allentown,” said Bishop Alfred Schlert, principal celebrant and homilist of a Mass with women religious of the Diocese on the World Day of Consecrated Life Feb. 2 at St. Francis of Assisi, Allentown. The morning liturgy on Candlemas Day was followed by a brunch in the parish hall. Monsignor Thomas Koons, vicar for religious and pastor of Assumption BVM, Northampton, concelebrated. Father Keith Mathur, assistant in the Diocesan curia and director of the Diocesan Office for Divine Worship, was episcopal master of ceremonies. 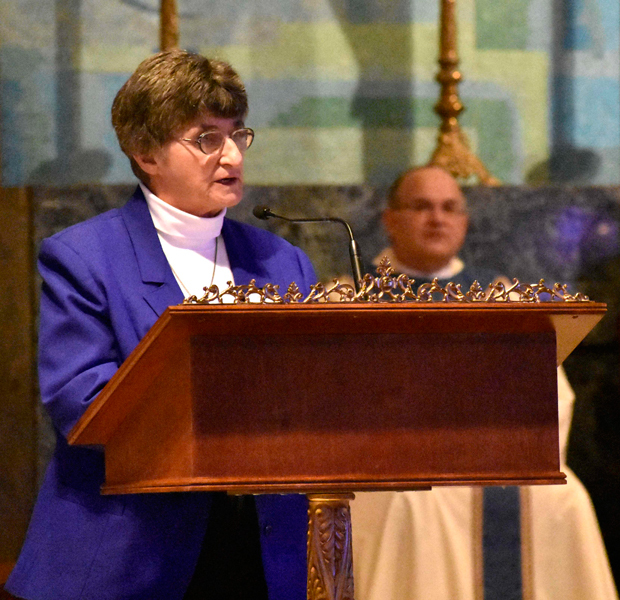 Serving as lectors were Sister Dorothy Fabritze and Sister Vincent de Paul. Serving as gift bearers were Sisters Apostles of the Descent of the Holy Spirit Sister Mary Jerome Kim and Sister Mary Francesca Seo. The St. Francis of Assisi Choir provided music for the liturgy. “Today is a time of worship and community,” Bishop Schlert said in his homily. 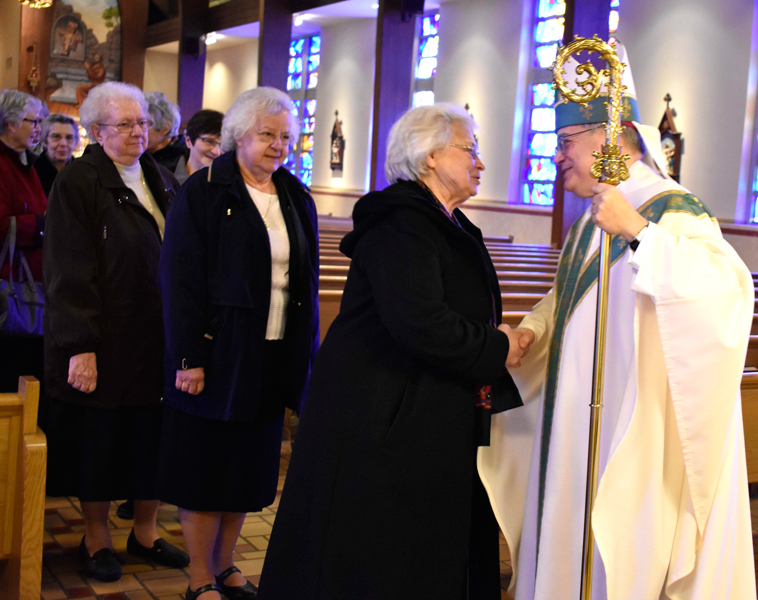 “Thank you for your service over the years to the Church, serving and evangelizing the people of God,” Bishop Schlert told the sisters. 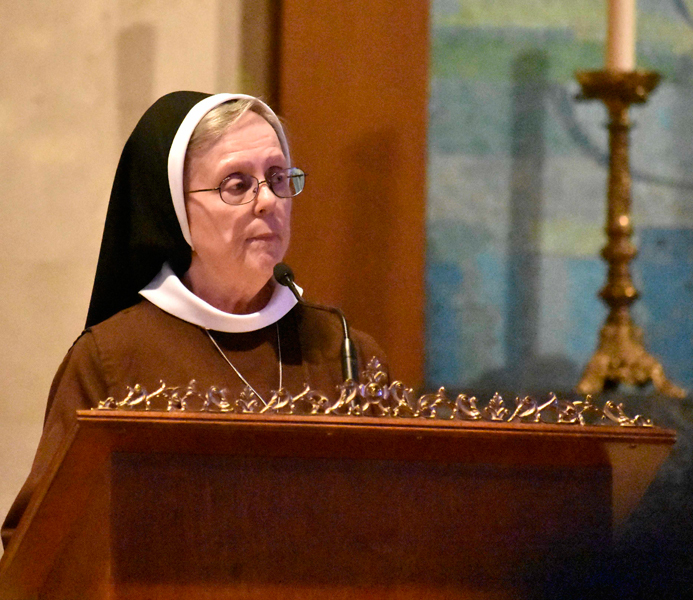 Bishop Schlert said in a time when not much was open to women in what the secular world would regard as “men’s work,” women religious were serving as school principals, working in hospital ministry and administration, and running charitable organizations. They worked in health care, social services and education. “They stood up and did it,” Bishop Schlert said. “We are all beneficiaries of that – I am and so many others. “We know most will and would not choose your life. But the Church benefits because you did and we benefit because you did. “We are in a time in the Church when people see the Church not always as a model of holiness, or see religious positions used for evil purposes. We have to pray for that. The Bishop said the beautiful thing in the Church is we’re all given different vocations in the Church, and look to each other to live them authentically. These vocations include the priesthood, diaconate, religious life, married life and chaste celibate life. 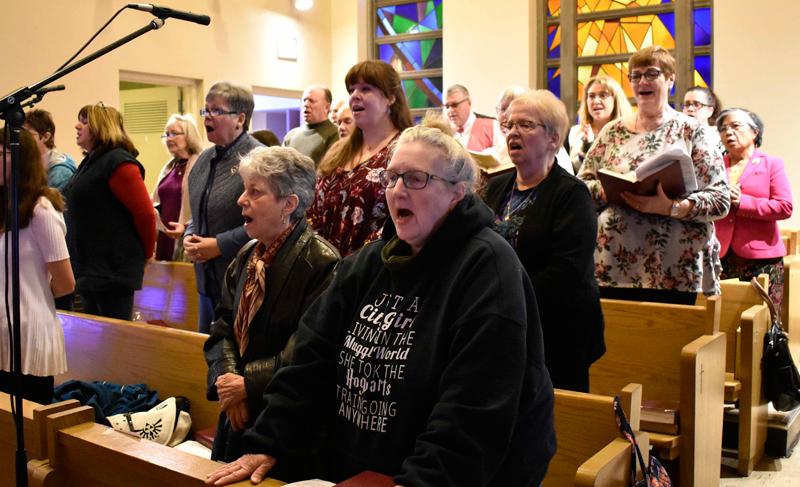 “Today we give thanks for those in our community who have set themselves apart through consecration to serve the Church,” Bishop Schlert said. “Thank you for the gift you give the Church, and pray for more vocations for women in consecrated life. “On this Candlemas Day, we thank you who accepted the call by your own free will to be set apart in consecrated life … to be lights of Christ illuminating the sometimes dark corners of society. The Bishop thanked the parish of St. Francis of Assisi and its pastor, Monsignor Victor Finelli, for their hospitality. In light of Candlemas Day, the sisters were given blessed candles to take home. Candlemas Day celebrates three occasions: the Presentation of the Lord, Jesus’ first entry in the temple and the Feast of the Purification of Mary. Bishop Schlert greets sisters after the morning liturgy. Sisters pray at the beginning of the Mass. Monsignor Thomas Koons, back, listens as Sister Dorothy Fabritze offers the first reading. Sister Vincent de Paul serves as lector for the second reading. 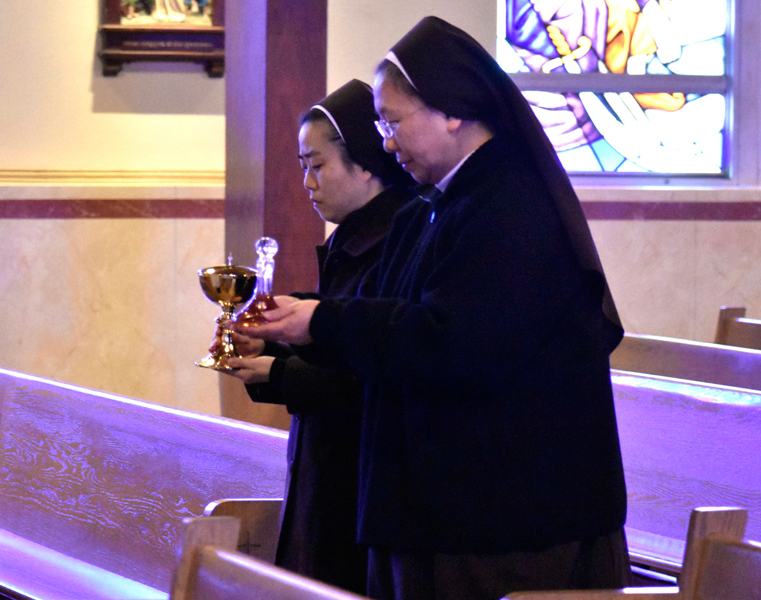 Sisters Apostles of the Descent of the Holy Spirit Sister Mary Jerome Kim and Sister Mary Francesca Seo bring the offertory gifts to the altar. The St. Francis of Assisi Choir sings during the Mass. Bishop Schlert distributes Communion to sisters.